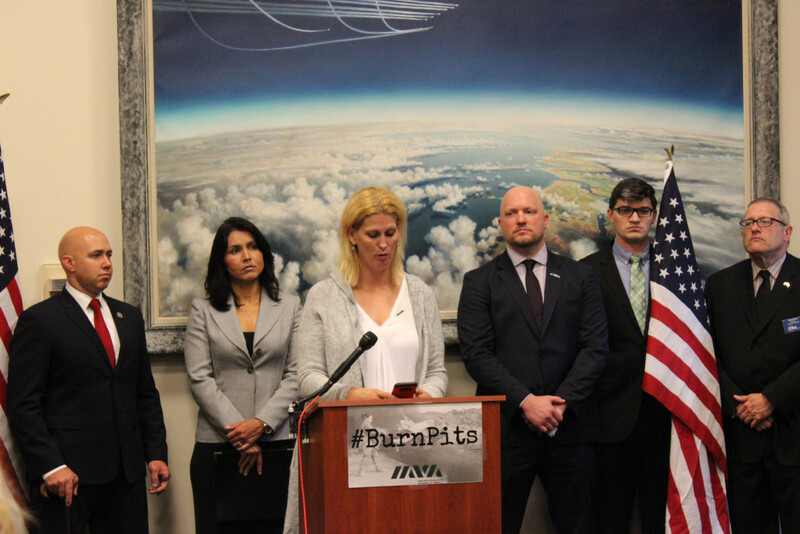 May 17, 2018 (Washington, DC) — Today on Capitol Hill, Iraq and Afghanistan Veterans of America (IAVA), the leading post-9/11 veterans empowerment organization, stood united with dozens of veterans organizations, veterans exposed to burn pits, and Representatives Brian Mast (R-FL) and Tulsi Gabbard (D-HI) for a historic press conference focused what could be the Agent Orange of our generation. Mast and Gabbard served in Afghanistan and Iraq themselves—and united across party lines to put country and their fellow veterans above any political differences. The group called on all members of Congress to sign on to the bill before Memorial Day at the end of this month. 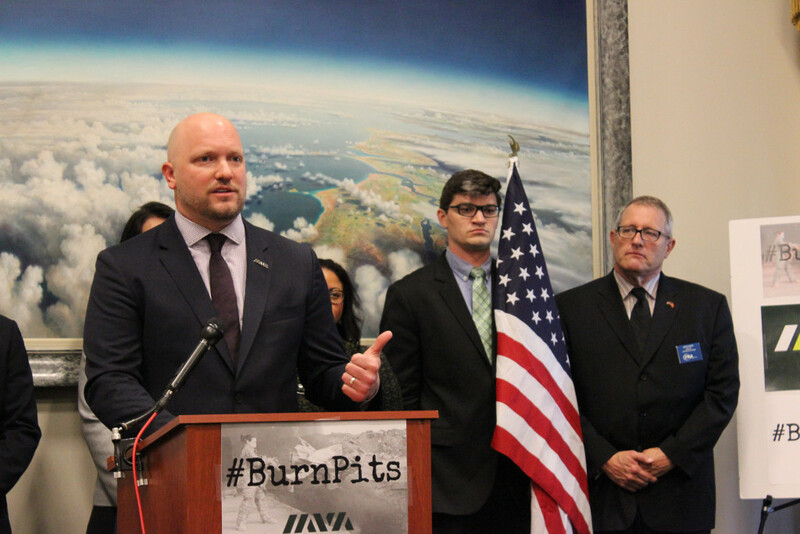 IAVA, Mast, Gabbard and their allies introduced the critical Burn Pits Accountability Act (H.R. 5671). This bipartisan legislation would study servicemembers’ exposure to open burn pits and toxic airborne chemicals to begin the process of understanding, assessing, and treating these service-related ailments. “Burn pits may be our generation’s Agent Orange. From the time we were founded 15 years ago, our members told us they were concerned and that sense of urgency has only grown. 80% report that they were exposed to burn pits during their combat deployments and 63% report associated symptoms already. They feel like they haven’t been heard, that the public doesn’t understand, and that we need action. That’s why we’re here today – to relaunch our campaign to raise awareness about what burn pits are, what our members have been exposed to, and to stand with allies to get something done. It’s an important first salvo in what could be a fight to last a generation” said IAVA Founder and CEO Paul Rieckhoff. 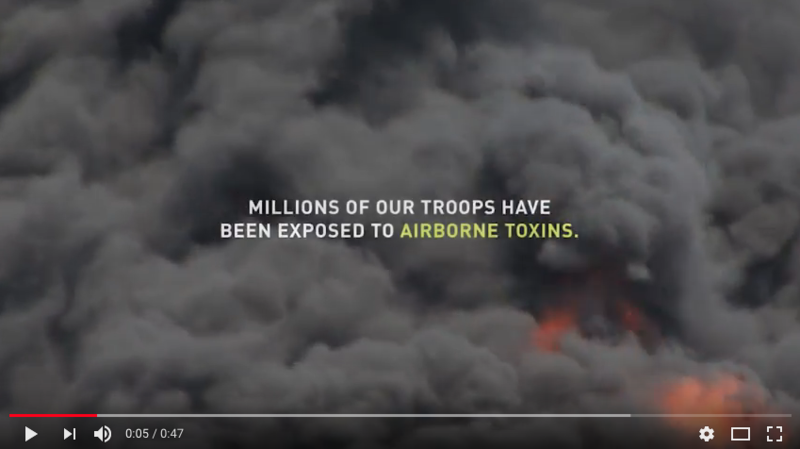 The VA estimates 3.5 million veterans are eligible to register in the VA’s Airborne Hazards and Open Burn Pit Registry, which tracks exposures to airborne toxins. “When I was serving in Afghanistan, trash and human waste were often burned in open air pits. I think it’s quickly becoming clear that these burn pits are emerging as the Agent Orange of my generation. Service members that were exposed in Iraq and Afghanistan are seeing terrible health effects at a very young age. These men and women risked their lives for our country, and this bipartisan legislation will go a long way toward getting them the care they have earned,” said Congressman Brian Mast, Republican from Florida. “Whether serving in Iraq or Afghanistan, our post-9/11 veterans were exposed to open-air burn pits, often for many hours a day. Some veterans who I deployed with are now falling sick with cancer and other illnesses. But, there is no research and data about exposure to burn pits and other toxic chemicals, and how they have impacted the health and well-being of our servicemembers and their families. Our bipartisan legislation will evaluate exposure to burn pits and other hazardous airborne chemicals to ensure our servicemembers and veterans receive the treatment and services they earned and deserve” said Congresswoman Tulsi Gabbard of Hawaii. Support for injuries from burn pits and other toxic exposures is one of IAVA’s Big 6 Advocacy priorities for 2018, focused on for the Post-9/11 generation of veterans, and veterans of all eras. More details are available in our 2018 Big 6 Advocacy Priorities and in the IAVA Policy Agenda.